alaTest zebrał i przeanalizował 3935 opinii użytkowników z magazynów i stron. Oceniającym podoba się wygląd i przenośność. Rozmiar jest również bardzo dobra. Oceniający mają wątpliwości co do jakości obrazu. Eksperci oceniają ten produkt na 83/100 a użytkownicy na 88/100. Przeanalizowaliśmy te oceny, wiek produktu i inne czynniki. W porównaniu do innych produktów z kategorii Kamery wideo, Gopro Hero 4 Black Edition uzyskał ogólny alaScore™ 95/100 = jakość Celująca. Even if you're not a pro shooter, the ability to capture in glorious 4K is a worthy investment. The GoPro Hero 4 Black is an expensive action camera, but it's packed with shooting options and provides great image quality. 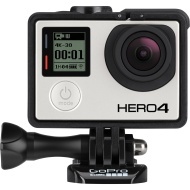 If you're looking for a small action camera that can capture video at 4K, the GoPro Hero4 Black is the one to get. 4K capture. Slow motion HD capability. Rugged design. ProTune recording. Time Lapse photo option. Integrated Wi-Fi and Bluetooth. Waterproof to 131 feet with case. Many mounts and accessories available. Includes editing software. Expensive. Short battery life. No LCD. Clunky interface. Lens shows lots of distortion. Omits image stabilization. Requires optional accessory for tripod use. Doesn't include AC adapter. It's expensive, the battery life can be brief and the design might not be ideal, but GoPro's top camera continues to lead in video quality. The GoPro Hero4 Black delivers best-in-class video at resolutions up to 4K at 30fps or 1080p at 120fps. Wide assortment of mounting options from GoPro and third-party manufacturers. Battery life can feel painfully short and due to a redesign you can't use older batteries with the Hero4. No option for in-camera digital image stabilization and it still needs a housing to be waterproof. The GoPro Hero4 Silver is still our top choice for most people, but if you need the best video quality with the most shooting options, the Hero4 Black is it. The market-leading action cam's pro-level incarnation is strapped in and ready to roll, but does it live up to the hype? A fantastic pro-level creative tool for capturing the action, but think hard whether you really need to pay the extra over the Hero4 Silver. The GoPro Hero4 Black brings a major step up in video performance and some useful improvements to the design and control interface too. It’s GoPro, and they are good. It’s also got 4K30, so that is even better. Assuming you can swing the price, which sounds like it is worth it for a product such as this, what is keeping you from going out there and making professional video?